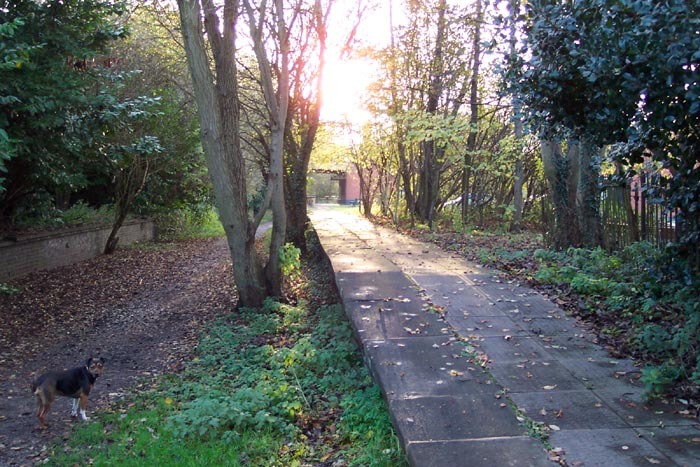 Tettenhall station site today is the sort of find you hope to come across when visiting the site of a long-gone station but seldom do. In terms of the grand scheme of things, the station, and indeed the line itself, is of little significance in the history of the region's railways and in particular of passenger services. 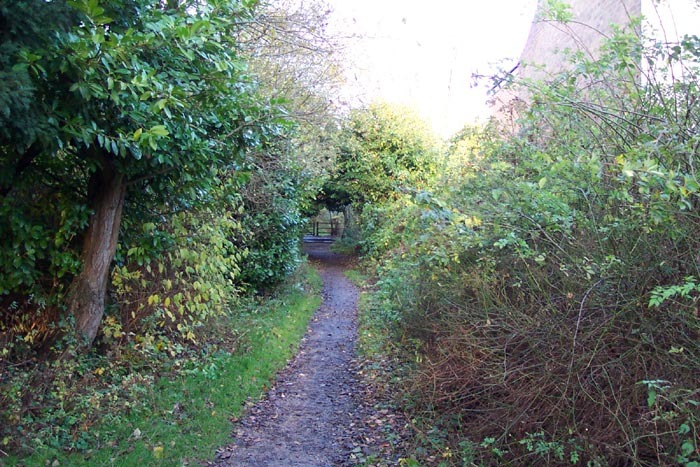 However, as with both the Harborne and Halesowen Railways, as they have completely disappeared they have taken-on a rather 'mythical' existence in local railway studies and I have to confess that I too find them fascinating subject matter. 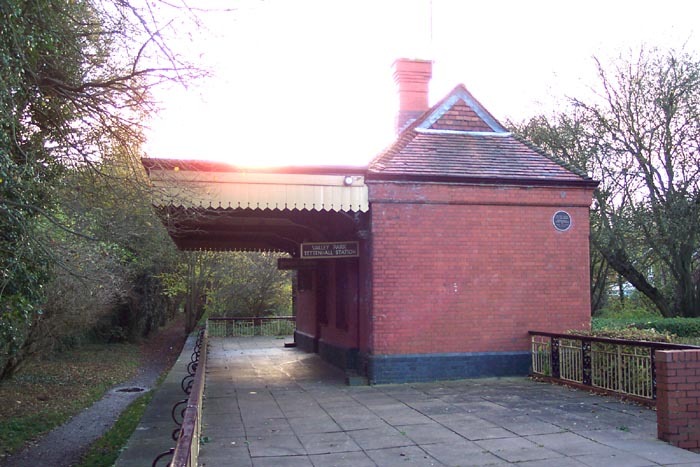 Opened by the GWR in 1925, along with the line's induction as a passenger carrying concern, Tettenhall lost its passenger services some 7 years later but survived for goods traffic until 1965 when the last train passed over the line on 24th of June. 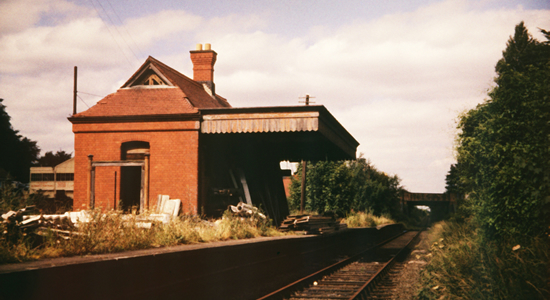 Above we see the station in 1967 (photo: David Bathurst) looking somewhat dilapidated post-closure towards Wolverhampton. 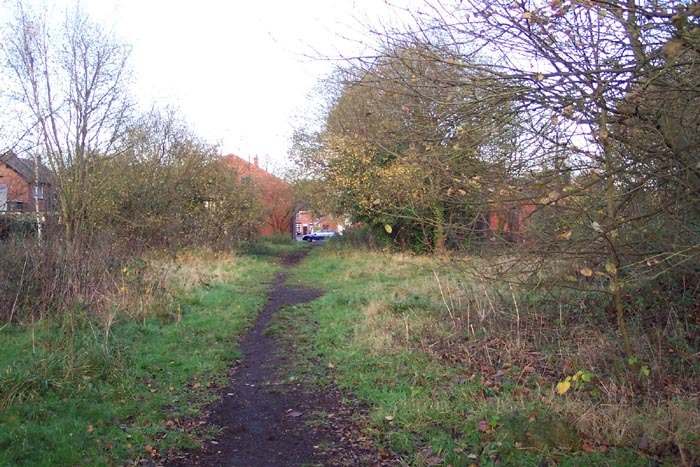 Above-left we are standing in Meadow View - previously known as Station Road - looking down to the station site. 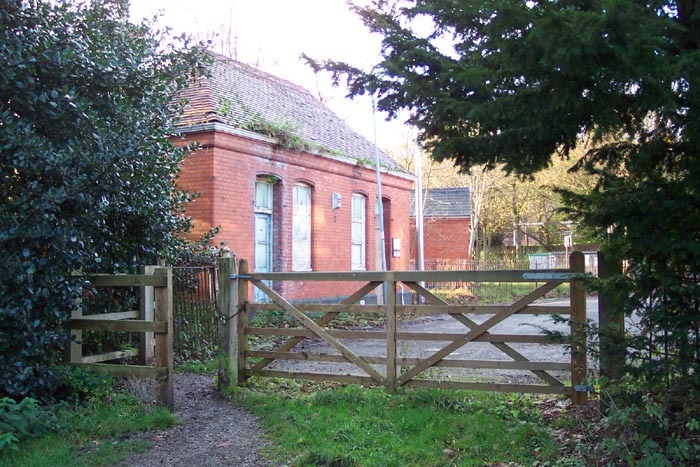 I was aware that the trackbed and down platform waiting room had survived but was pleasantly surprised to see that the booking hall, and the weigh bridge building (the small brick 'hut' nearest to the camera), had survived and seemed in a reasonable state-of-repair. Above-right we are looking directly at the front of the booking hall on Meadow View. Above-left we have wondered through the entrance to the goods yard (that appeared to the right of the weigh bridge office - the weigh bridge itself sadly long-gone - in the shot above) and are looking at the rear of the booking hall and weigh bridge office. The striking thing here is the lack of vandalism and graffiti! Turning 180 degrees from the previous shot, above-right was another pleasant surprise. 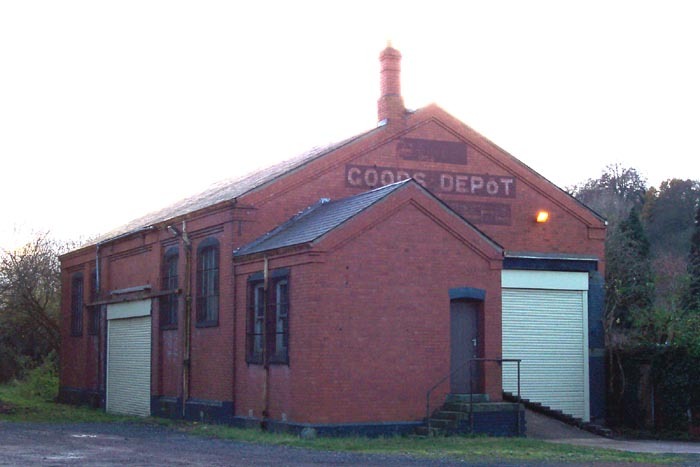 This is the goods shed still displaying 'Goods Depot' on its wall and appearing in very good repair. The major change to appreciate here is that, although looking remarkably 'period', there are now large roller-shutters either end (as can be seen here) which either obscure the original archway entrances to the shed or have necessitated the archway's removal: it was impossible to tell without gaining access to the interior. 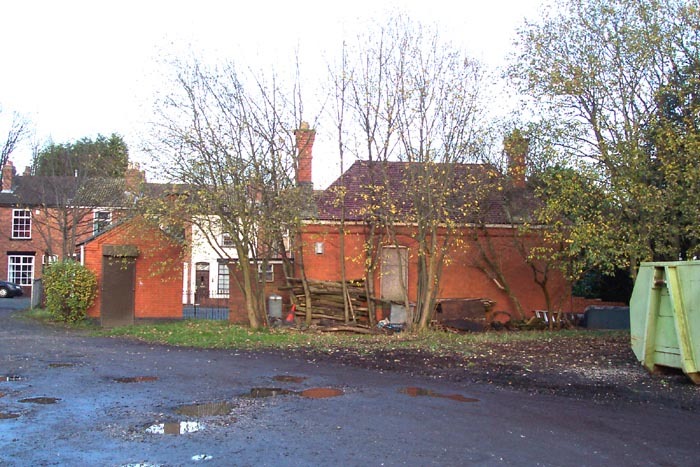 Above-left we see the rear of the goods shed, or 'front' if you are approaching by rail. 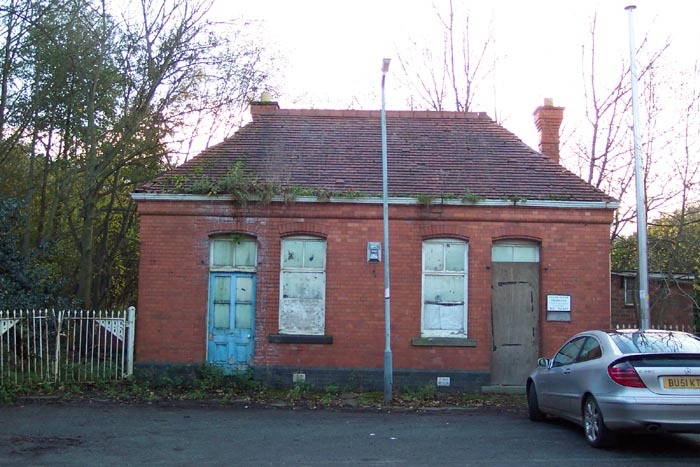 The goods shed itself has had quite a good run since closure of the line, first being home to A & T McNulty Ltd and now housing the local mobile library. 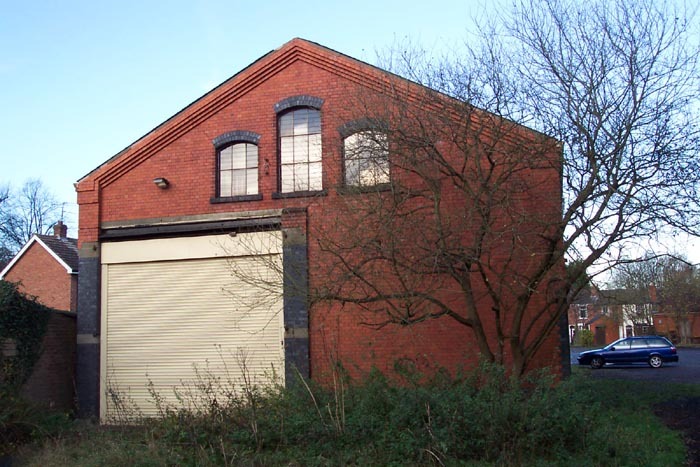 This use has meant that the building has had to be kept in good repair and hence has served a preservational function. 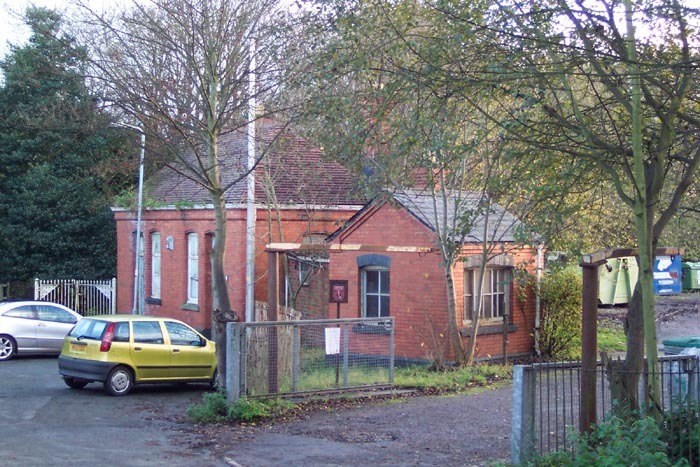 Above-right, in the far left-hand corner of the goods yard/car park as you enter from Meadow View is this site; the preserved down platform waiting room complete with the classic GWR 'darted-fringe' canopy. Above-left we have walked onto the trackbed and, with the station to our rear, are looking at the track heading off towards Oxley Junction where it joined the GWR main line out of Wolverhampton Low Level just North of Dunstall Park. Above-right we are still in the same spot but have turned to our left to view the booking hall and weigh bridge office from the trackbed itself. Above-left we are still in the same position but this time looking towards Compton along the length of the down platform and can see the waiting room in the distance. 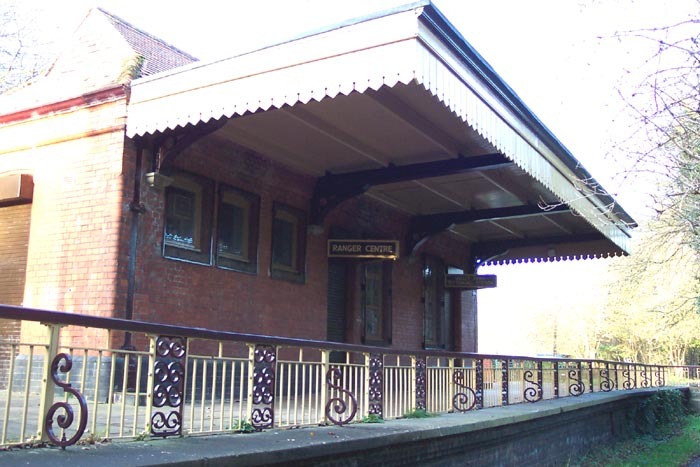 Above-right is a closer view of the down platform preserved waiting room with the goods shed visible on the right-hand side. Unfortunately, the now-necessary staircase chiseled into the side of the platform and safety rail outside the waiting room spoil what would otherwise be a view of the station directly comparable with it in its heyday. 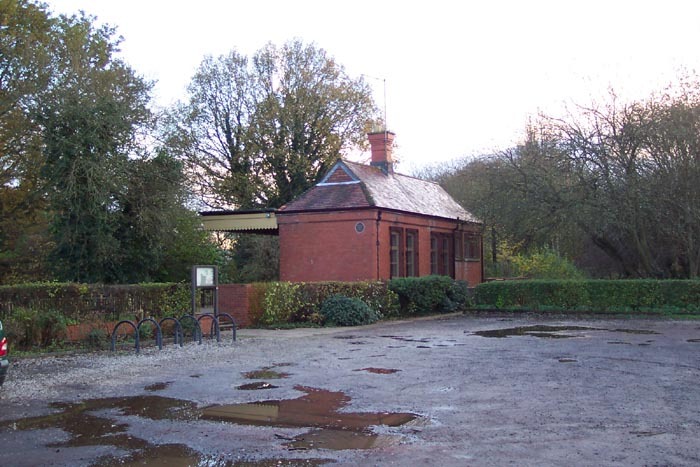 Above-left we are standing on the down platform looking at the waiting room - the protruding (and in-keeping) signpost on the building reads "Valley Park - Tettenhall Station". 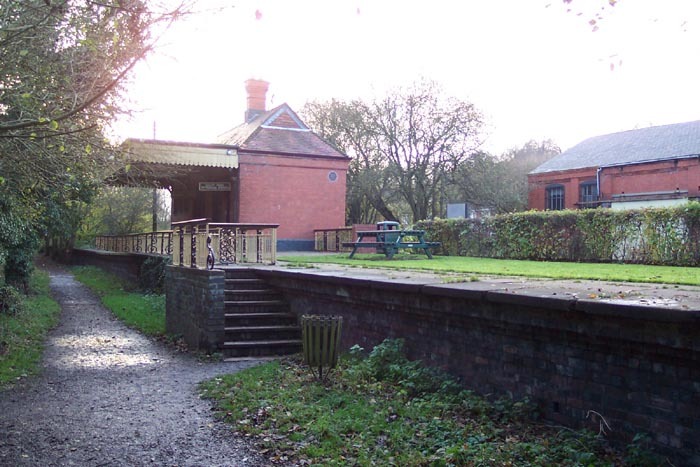 The building is now used as a Park Ranger station which, along with the goods shed, has ensured a good standard of upkeep for the structure. Above-right we see the building from track-level. Above-left we have headed along the trackbed towards Compton and have turned to look back towards the station to take-in this interesting part of the platform arrangement here. 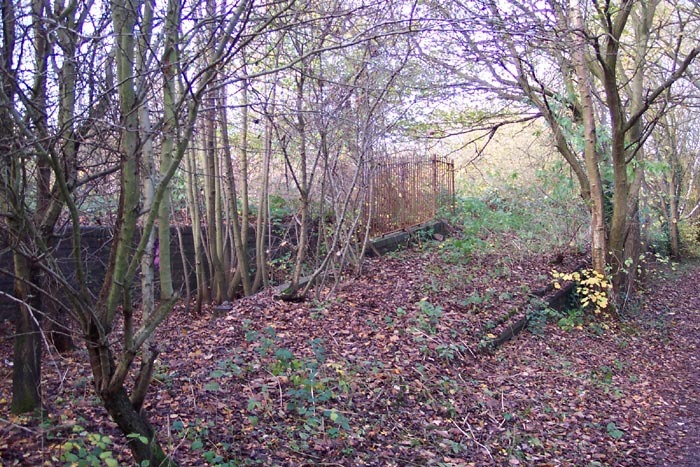 This view shows a bay at the end of the down platform (main trackbed to the right) presumably for goods purposes. Above-right we have moved to the left of the previous shot (the bay is now off-camera to our right) and are looking along the trackbed of the goods line that fed into the goods shed ahead. This was a fascinating site to wonder around and I spent a considerable amount of time there (including looking at the bridge over the Staffs & Worcs canal just down the line that can now be seen on the 'Misc' pages).